German states stamps for the Free Hanseatic City of Lübeck were first issued in January of 1859. The city-state of Lübeck has existed since the 12th Century, and for several centuries, it was the capital of the Hanseatic League. It is the second-largest city in Schleswig-Holstein and also one of the major ports of Europe. 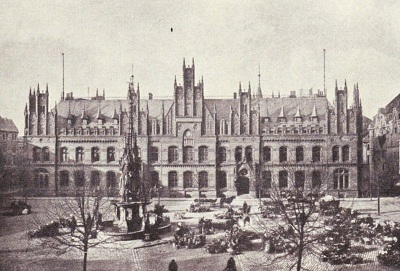 At the time the first stamps for Lübeck were issued, there were also post offices for Thurn & Taxis, Mecklenburg, Hannover, Denmark, and Prussia located in Lübeck. This competition in postal services may account for the fact that unused Lübeck stamps are relatively common and inexpensive and that most of the used Lübeck stamps are rare and very expensive. 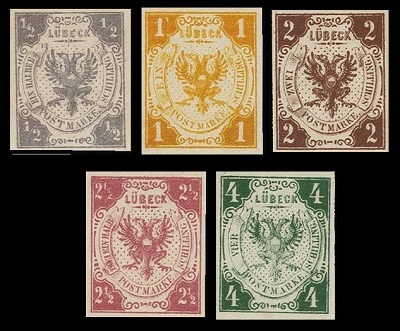 The five German states stamps for Lübeck shown above were issued between 1859 and 1862. They are all lithographed and imperforate. 1/2 S. (1859 - Mi. #1, Sc. #1) - Gray Lilac. 01 S. (1859 - Mi. #2, Sc. #2) - Orange. 02 S. (1859 - Mi. #3, Sc. #3) - Brown. 02 1/2 S. (1859 - Mi. #4, Sc. #4) - Rose. 04 S. (1859 - Mi. #5, Sc. #5) - Green, Yellow Green. 1/2 S. (1862 - Mi. #6, Sc. #6) - Lilac. 01 S. (1862 - Mi. #7, Sc. #7) - Yellow Orange. "Official" reprints were made in about 1872. The colors are brighter than that of the originals. They were printed in sheets of 25 on unwatermarked paper without gum. Positions 95 to 98 from the sheet of the 2 Schilling denomination are shown in the image above. Positions 96 and 97 show the "ZWEI EIN HALB" Error! The ribbon at the left side of the eagle has the denomination inscribed as "ZWEI EIN HALB" or 2-1/2, instead of the normal "ZWEI" or 2, the actual denomination of this stamp. Being that there were only two of these errors for every 100 stamps printed, they are very scarce today (Mi. #3F, Sc. #3a). The so-called "Wounded Soldier" Reprints were produced for a highly decorated soldier returning from the Franco-Prussian War. When asked by the Lübeck royal family what he wanted for his service retirement, he asked for "some of those beautiful old Lübeck stamps that we used to use." The printers were ordered to produce a few sheets of each of the 14 issues of Lübeck (1859-1865) and give them to him, with a small supply being held in reserve for the postal museum. These reprints were produced from the original plates (possibly re-touched) and were printed on unwatermarked paper (Mi. #1-5 ND). The colors are a bit sharper than those of the original 1859 printings. There are very dangerous 19th Century forgeries of all the early German states stamps of Lübeck. Caution should be used, when buying any of these stamps. It would probably be safe to assume that the cancellations on any off-cover examples of these Lübeck stamps being offered for sale, that are not either certified or otherwise authenticated, are probably fake. 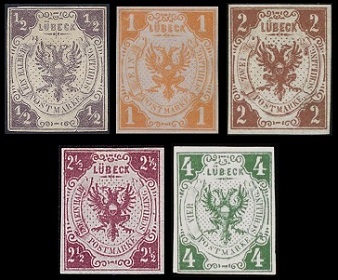 The five German states stamps for Lübeck shown above were issued between 1863 and 1867. 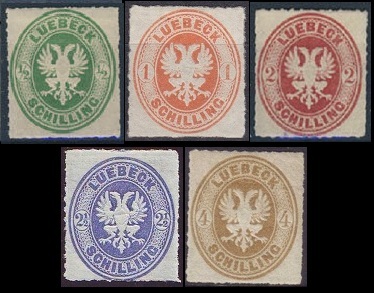 The stamps are printed on unwatermarked paper with the embossed Coat of Arms of Lübeck in the center, and they are all rouletted. 1/2 S. (1863 - Mi. #8A, Sc. #8) - Green. 01 S. (1863 - Mi. #9A, Sc. #9) - Orange. 02 1/2 S. (1863 - Mi. #11A, Sc. #11) - Ultramarine. 04 S. (1863 - Mi. #12A, Sc. #12) - Bister. 01 S. (1867 - Mi. #9B, Sc. 9a) - Orange. The official reprints of these were made in 1872. They are imperforate and do not have embossing. The 1 1/4 S. denomination Lübeck stamp shown above, at the left, was issued in 1864 for letter destinations within Schleswig-Holstein. This stamp is unwatermarked and imperforate. The 1 1/2 S. denomination Lübeck stamp shown above, at the right, was issued in 1865. This stamp has an embossed eagle in the center, and it is rouletted 12. 01 1/4 S. (1864 - Mi. #13, Sc. #13) - Dark Brown, Reddish Brown. 01 1/2 S. (1865 - Mi. #14, Sc. #14) - Red Lilac. Reprints of the 1 1/2 S. denomination are imperforate and without embossing. In January of 1868, the German states stamps of Lübeck were replaced by those of the North German Confederation.